Purchase Bin Storage For Your Preschool Or Daycare! How can you keep preschool supplies neat? By getting some convenient bin storage from Hertz Furniture. 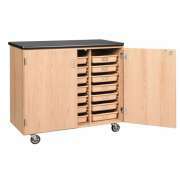 Whether you need to organize art supplies or learning units, we have some great styles and sizes to fit your needs and your space. 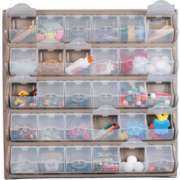 Plastic bins keep everything just where you need it, contained neatly and ready to go at any time. 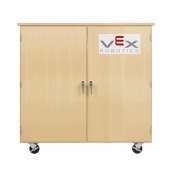 Plastic bin storage comes in freestanding and wall-mounted designs. Freestanding units are flexible so they can be moved around to various rooms if you decide to reorganize or rearrange your preschool. Wall-mounted storage keeps supplies out of reach of small hands so you can ensure they won’t be spilled or tampered with. 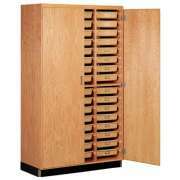 What is the difference between cubby and bin storage? Bin storage includes storage bins, so you don’t have to go hunting around and paying extra to find an appropriate fit. This can save you time, money and frustration. When bins can easily be taken and used for other things, it’s possible for unauthorized people to move them around without a teacher knowing. This can be a frustrating situation when you are trying to keep a classroom organized. 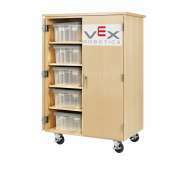 When cubby bins are attached to bin storage or sized specifically for a particular unit, they can’t simply be taken and used for something else. When you just have supplies placed directly on shelves, they can accidentally get knocked off or shifted out of place. Plastic bin storage keeps supplies contained so they won’t get shifted around unintentionally. Bins with lids are ideal because they have a neat look, don’t spill, and can often be stacked to save space and create an organized look. What are the benefits of wall-mounted bin storage? While all bin storage units will help keep you organized, wall-mounted units have some unique benefits. If you are using them in a preschool or early-childhood center, they offer a great way to keep supplies close at hand but out of reach for small children. This also saves the time and effort of having to bend down and hunt for what you need because wall-mounted bin storage can be hung at whatever height is comfortable for you. With bins at eye level, it is easy to see what is in each bin so you don’t have to open every single one to find what you need. The small, built-in bins are perfect for art supplies such as googly eyes and pompoms. They are ideal if you have lots of little things, instead of having large bins which are probably bigger than you need for small supplies. To choose the right wall-mounted bin storage system, you need to think about how much space you have and how much you need to organize. 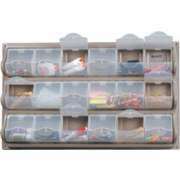 It makes a big difference whether you just have a few things you need on a regular basis or a full stock of supplies. Getting a unit that is too small will make it hard to decide what to leave out, but a unit that is too large will be a waste of funds and space. To avoid either of these potential problems, it’s good to think about exactly how much you need in your classroom or storage room before you choose so you don’t use up extra space but still have enough room to store what you need.